Farosh, Dinraal & Naydra are ancient dragon spirits in Zelda Breath of The Wild. They can be found floating across the skies of Hyrule, and you can shoot them to get monster parts of them. Depending on where you hit them, they drop scales, shards, fangs & claws. Each of these parts is very valuable – they can be used for all kinds of things, from finishing quests to selling for fat profits. In this guide, we’re going to show you how to farm Naydra, Dinral & Farosh in Zelda Breath of the Wild. Dragons spawn around 22 in-game time and through the night. When a dragon spawn, music will change. It’s important to know that you’ll increase their spawn chances if you don’t stand close to the place where they appear in game and start their route. Which part you get from the dragon spirit depends on where you hit or shoot it. Hitting the horns or crest will yield the shard. Shooting the mouth will drop the fang. You can get the claw by hitting the legs. Shooting any place other than the ones already listed will net you the scale. Use them to upgrade armor like the Champion’s Tunic. Use them to open up three secret shrines. Use them as cooking ingredients. Sell them to Kilton for a lot of Mon. Sell them to regular traders for a lot of rupees. Dinral, the fire spirit, appears around midnight at the Elding Great Skeleton, on the northern edge of the map, but some people also reported that you can find him between 3:00 AM and 8:00 AM. Bring some wood and flint so you can camp until he shows up. Stand on the skeleton and wait for him to dive down, then glide up towards him and shoot him. He shoots fireballs, so you might want to equip some heat resistant clothing before you start. 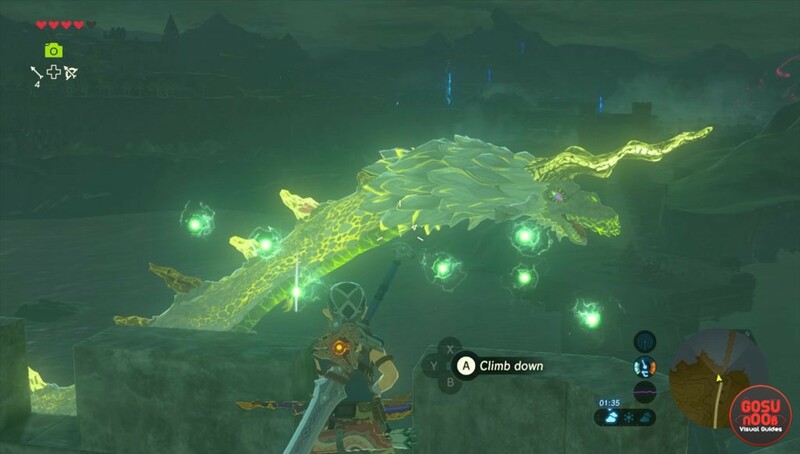 Farosh, the thunder dragon, appears at Lake Hylia, in the Faron region, at midnight. Make sure you have wood and flint to set up camp, then wait for him. If he’s not there, camp until tomorrow and repeat the process. Climb the tower at the end of the bridge, and wait for him to pass by it. Jump off the tower and glide towards him. There’s always an updraft around him, so time will slow down when you take aim. You can also find him in Floria Falls. From Faron Tower head to Lakeside Stable and wait around the bridge till 22 in-game time. His route starts from Riola Spring, going south to Rassla Lake, where he dives into the water. Just sit on the bridge and wait for the best shot. Naydra, the purple dragon, is first found at the pond on the top of Mount Lanayru, in the east of the map. You’ll have to shoot the malice eyes across its body to release it. After that, it will start spawning on the western slopes of the mountain. Your best bet is to wait for it at the Lanaryu Road East Gate. You can easily shoot it from there. Something that provides protection from cold would benefit you, as the dragon shoots shards of ice. You didn’t say what time of day Naydra spawns, I can’t seem to find it anywhere either. Also, a Lynel spawned near the archway for me and started lobbing arrows. Advise resting on the cliffside instead. You can use an ancient arrow from the Akkala ancient tech lab to instantly vaporize the Lynel. 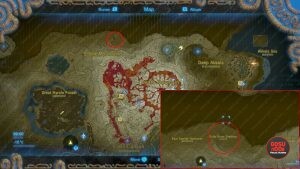 If you pray at the shrine of wisdom and wait until morning (~5:00) under the bridge, Nydra will spawn at the top of the mountain. He’ll arrive near you around 6:10, which is your time to strike. I think it’s safe to assume all of the dragons spawn at midnight. They did for me atleast. All of them first spawned at midnight. This method works 100% of the time to get them spawning. 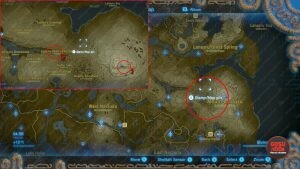 First teleport to any of their spawn areas – Farosh = Lakeside Stable, Dinraal = Tabantha Great Bridge Stable (I forget the actual name), Naydra = Make a camp above Lanayru’s Promenade area. 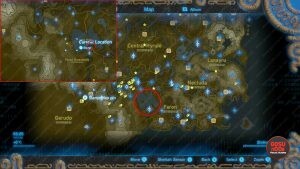 Here’s the important part: Rest at whichever area you are in and wait until morning, the dragon will spawn just wait a little. Get your item then go to a different dragon spawn and rest until morning. Wait for spawn, get item, repeat for however many times needed to get all items. Where is Lanaryu Promenade? I don’t see any location named that. Directly East of Kakariko Village. It’s shaped like the human female reproductive system. I’ve definitely seen one of these guys (can’t remember which) flying through Tanagar Canyon in the northwest near Rito village. That’s Dinraal. He flies from Eldin Great Skeleton towards Hebra Mountains and before reaching them he flies south and down into Tanagar Canyon. At the west end of the canyon I think he despawns. Farosh also runs straight through the canyon risoka snowfield and statue of the eighth herione to the Gerudo summit. Plop down 5-10 Wood to create your own wind at the peak right by the canyon. Runs through there before ascending to the heavens at 2 am. Using the wind your right at his eye/horn height, slowe aim and farm. Camp at Lake Hylia (southern bridge tower) until morning. I’ve done this about 30 times and every single time he immediately flies out from the water. do you need to shoot any specific part of the dragons to get specific body parts? I tried shooting the horns to get horn shards but nothing falls unless I hit their bodies, and even then it’s only scales. Should I use bomb or ancient arrows to get rarer body parts? No, but you do have to be very specific where your arrow lands. We got nothing but teeth for ages when trying for a horn, because we kept accidentally hitting the mouth instead of the horn. Dinrall isnt spawning for me?!?!? You can easily farm Dinrall at the Tabantha Bridge. Start at the Tabantha Bridge Stable, get your horse, sit by the fire and make it night time. It will be 9pm when you do, and as you cross the bridge to get to the other side, Dinrall will already be heading your way (at 9:20pm). Get to the other side of the bridge and at the rocks edge to jump off above him, glide, and shoot that arrow at whatever body part you are looking to acquire. When you see the piece fall, note where it lands and start gliding again to float down to it. As soon as you have it, warp travel to the Shrine right next to the Tabantha Bridge Stable, and repeat everything all over again. Happy hunting!